Tip: There is no difference between these oils as sold for humans and for dogs; it's just the packaging that is different. Always work with your veterinarian or animal nutritionist when providing supplements; Always inform your vet of what you are giving your dog, and discuss the proper dosage with them. 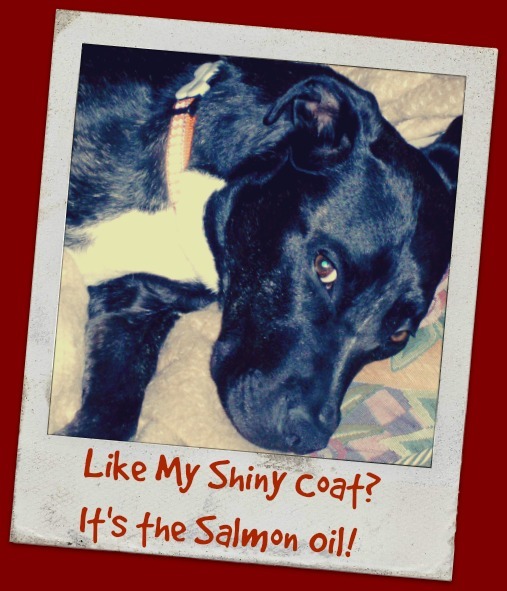 We have been using Salmon Oil for years in our own dogs' food. We started using it to help with that flaky skin issue common in many short-haired dogs, as well as to help make their coats nice and shiny. Of course, we researched it thoroughly before we started and learned that Salmon Oil is also a great joint supplement. Plus, it has the added benefit that it supports organ and brain health. I can always tell when a dog is taking Salmon Oil; their coats are absolutely beautiful! Orally: Add it to your dog's food. Decreases inflammation, relieves allergic responses throughout the dog's body. Salmon Oil has valuable omega-3 fatty acids and provides many benefits for dogs, with virtually no side effects. The omega-3 fatty acids are found in particularly high levels in salmon (as well as other cold water fish). Salmon Oil is recommended for dogs with skin allergies and to help various skin conditions heal faster. Many commercial dog foods contain salmon meat or added salmon oil, but the omega-3 fatty acids in these foods are at such low levels, that they are nowhere close to what most experts would recommend for maintenance supplementation. You may want to supplement the capsules or liquid fish oil with cooked salmon or sardines, both of which contain fish oil naturally. Tip: Sardines are also a great source of omega-3 fatty acids, so toss one to Fido! Next time you open a can of tuna and start to strain off that juice, save it and drizzle over his food. We recently started using Coconut Oil, and I think it really helps our dogs. One of our dogs is older (13 years as a Pittie/Lab Mix) and started having some mobility issues and low protein levels. And one of our other dogs was being operated on to remove a cancerous mass from his leg. These two incidents, which came shortly after another of our dogs passed away at age 17, was what prompted us to look into providing more supplements to our dogs. We decided that we wanted to give them the best possible chance at a strong and healthy body. What we discovered in our research was that all five of our dogs could benefit from these oils, so now they all get them! Topically: Coconut oil can also be used as a topical treatment for skin problems. For example, coconut oil can be used to improves overall skin and hair condition. Applied topically, promotes the healing of hot spots, bites, and stings Prevents and treats yeast and fungal infections, including candida. It also disinfects scrapes and cuts, promotes wound healing, and clears up warts and moles. Start slowly; coconut oil rids the body harmful bacteria, so it can cause symptoms of detox (diarrhea, vomiting and other flu-like symptoms). Start with 1/4 teaspoon a day for smaller dogs, one teaspoon a day for larger dogs. Coconut oil has healing properties. It is anti-viral, anti-bacterial, and anti-fungal, plus it can help digestion. It fights the production of yeast, and decreases inflammation. It is well-tolerated by animals and can be used internally or externally. The lauric acid in coconut oil provides many of its benefits. Coconut oil is a saturated fat, made up of a medium chain of fatty acids, and contains lauric acid, capric acid, and caprylic acid. The lauric acid is responsible for many of the oil's health benefits. Protects from illness; Helps prevent or control diabetes, Balances the thyroid, Aids healing of digestive disorders like inflammatory bowel syndrome and colitis; Clears up skin conditions such as eczema, flea allergies, contact dermatitis,and itchy skin, Regulates and balance insulin and promotes normal thyroid function, Prevents osteoporosis, Helps to manage diabetes. Look for unrefined or virgin coconut oil. Highest quality is organic extra virgin coconut oil, which has been cold pressed. We purchase our coconut oil from Amazon in bulk, and then we spoon out the solid into a tiny glass bowl, and set that bowl in the sink in hot water to melt it. (We just put the stopper in the sink, fill the hot water to just below the bowl's edge, and start preparing their food. By the time we are ready to add the oil, it's already melted.) Once the oil becomes a liquid again, we use the measuring spoon to distribute it to the food. Any un-used oil simply hardens again for the next time. If you would like to give salmon oil or coconut oil a try, let us know! We can add yours to our next order.